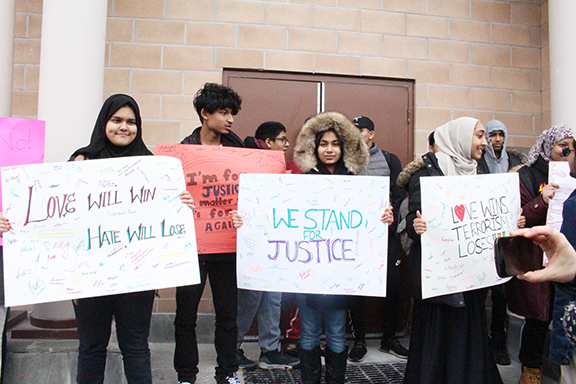 Students from Danforth Collegiate and Technical Institute attended the Ring of Peace on Friday afternoon and held up signs to show support to the Muslim community at Madinah Masjid at 1015 Danforth Ave. Photo by Trisha Sales. Friday afternoon was a day for prayers as people from all walks of life gathered at the Madinah Masjid Mosque on Danforth Avenue. A Ring of Peace event was held at the mosque at 1015 Danforth Ave. on March 22 afternoon to remember the 50 people who were killed in the mass shooting in New Zealand at two mosques in Christchurch on March 15. Supporters were outside Madinah Masjid holding up signs calling for an end to Islamophobia and to show their support towards the Muslim community. People from many faiths, non-profit organizations and students from Danforth Collegiate and Technical Institute were among those who took part in the Ring of Peace. Rabbi Miriam Margles of the Danforth Jewish Circle gave a speech to remind everyone the intention of the gathering; to commemorate those who’ve been affected in the New Zealand terror attack and to show solidarity. “We are here in partnership and solidarity. We are here in the work of justice and in the rigorous embodiment of the ideology of love,” Margles said. Margles mentioned in her speech that there were at least 16 Rings of Peace taking place in Toronto on Friday. Members of the Toronto Police Service also came together to ensure that the public safety was maintained and people felt safe during the time of worship. The supporters were invited inside the mosque, and many were able to witness the afternoon prayers. Ilwad Jama, a Muslim woman who attended Friday’s prayers, said she feels similarly situated because of comparable attacks that happened in a Quebec City mosque on Jan. 29, 2017 that took the lives of six people. She thinks that regulations around the mosque will change because of the recurring attacks towards the Muslim community. But seeing the overwhelming support on Friday made her feel a sense of community. “It’s really heartwarming. We’ve had a lot of worries about security, of whether or not to attend a mosque on Friday given the events of New Zealand,” Jama said. The community Ring of Peace was intended to encourage the Muslim community to continue attending the mosque and to practice their faith without fear. “We as a Muslim community will be in the front line to stand against hatred,” said Synkh Abdullah, Friday prayer leader at the mosque.